Zebra 3400 high performance wax / resin offers excellent print quality on a wide range of coated and uncoated papers, and many matt synthetic facestocks. 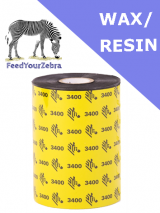 Zebra 3400 series wax / resin thermal transfer ribbons for Zebra industrial printers including Zebra S4M, Zebra ZT220 (maximum length of 300m), Zebra ZT230, Zebra ZM400 and ZM600, Zebra 105SL and Zebra 105SLPlus, Zebra 110Xi4, Zebra 140Xi4, Zebra 170Xi4 and Zebra 220Xi4. Zebra 3400 wax / resin formulation for Zebra industrial printers, offering excellent print quality on a wide range of coated and uncoated papers, and many matt synthetic facestocks. This ribbon excels when rotated barcodes are required. This high performance wax/resin ribbon also provides good abrasion and some solvent resistance, and is competitively priced, offering an economical solution to many industrial and retail labelling applications.